Distinguishing Characteristics Biracial (African-American/Caucasian) female. Shariece's nose and ears are pierced. Shariece and her mother, Joanna Clark, disappeared from Baltimore, Maryland on February 4, 2017. They were last seen at separate times. 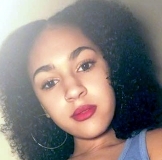 Shariece was last seen between 2:30 and 3:00 p.m. She had been babysitting her six younger siblings at the family's residence in the 2800 block of Round Road in the Cherry Hill neighborhood when her mother's ex-boyfriend, Dennis "Demo" Queen, came to the house. He said Shariece left at this time. Her phone pinged downtown that evening, but none of her friends saw her. Joanna was last seen late that evening. She had been out on a date and called a friend to ask for a ride home, then called back to say she was taking the bus instead. She spoke to her friend as she was arriving at her house and promised to call her again later. This was at 11:00 p.m. Neither Joanna nor Shariece has ever been heard from again. A photo of Queen is posted with this case summary. He said he was drunk and asleep and woke up at approximately 11:15 p.m. when someone came in, but he couldn't remember who it was. When he woke up in the morning, both Joanna and Shariece were gone. Neither of them have ever been heard from again. Queen made no attempt to report them missing and never asked anyone where they had gone. A family friend filed the missing persons report three days later, after she found out Joanna had missed work on February 6 and 7 and Shariece hadn't been to school. $800 in cash, which Joanna had been saving for the rent, went missing with them. Joanna and Queen had a long, troubled relationship; he began seeing her when Shariece was a toddler, and was the father of Joanna's six younger children, who were between the ages of two and ten when their mother and sister disappeared. Joanna was a reliable worker at the Goetze's Candy Company, but Queen was unable to hold a job for very long and was frequently unemployed. According to Joanna's loved ones, Queen had been abusing and stalking her for years. He also treated Shariece differently than the other children and had physically abused her before. Joanna repeatedly tried to leave him. She got a restraining order against him in September 2016, and it was still active in February, but Joanna had Queen back into the house to watch their children so she could go to work. Shariece deeply disliked Queen and never wanted to be in the house with him if her mother wasn't there. She had also begun spending the night in her mother's room. About a week before the women disappeared, Queen made sexual advances to Shariece and she told her mother. Joanna told him he had to leave, and said she would put all his belongings out on the street by February 4. This was the day she disappeared. Both of them were active on social media, but there hasn't been any activity on their social media accounts or their cellular phones since they went missing. Joanna's loved ones stated it would be uncharacteristic of her to abandon her other children, and Shariece has no history of running away from home. Joanna's other children were placed in foster care after their mother's disappearance. They have not provided any useful information about the day she and Shariece disappeared. Queen's brother took a lie detector test in the women's cases; the result was inconclusive. Queen refused to take the test. The police have not named Queen or anyone else as a suspect or person of interest in Joanna and Shariece's disappearances and said there was little "overt evidence" of a crime in their cases, but they stated they thought the women had met with foul play. Their cases remain unsolved. Updated 2 times since October 12, 2004. Last updated August 5, 2018; two photos added, details of disappearance updated.